Being welcomed back to work by my colleagues and clients. After being off of work the past two days, having worked over the weekend, it was really nice to return to work to warm smiles and people saying that they missed me and was glad that I was back at work today. It felt great to be appreciated, and it began my day on such a positive note. Having access to groceries. At first, I dreaded the trip to the grocery store that I had been putting off for several days, but as I drove to the store, it occurred to me how fortunate I am to live in a community that has an easily accessible grocery store only minutes from our home and that I have the money to purchase the food, drinks, household items, and personal products that our family needs. I work with people who lack all of the aforementioned things, which definitely puts this into perspective even more. Suddenly, a mundane chore became a moment of thanks. Having kind children. Tonight, my youngest daughter dissolved into tears, as she told me about how a girl in her class who has been one of her best friends made fun of her at lunch and enlisted another classmate to put my daughter down. As I soothed my daughter and discussed the situation and how to resolve it, my daughter talked about how she would never hurt anyone like that and could not understand why her friend would act this way toward her. It is tough enough for an adult to understand how cruel people can be, much less a child. While my heart ached for her, I was very thankful that she is such a sweet, caring, and loving little girl, and I was grateful for her older sister who had plenty of hugs and kind words for her sister. I am proud of both of my girls. So, that wraps up day twelve, and I hope that day thirteen proves to be my lucky number! Kristi you continue to inspire me with your posts. Also as a mother myself, you should be proud that you have such caring loving daughters. I am sure you are an incredible example for them. That is so very sweet of you to say, Sheila! I am very proud of my daughters, and I hope to be a good role model for them. I really appreciate you reblogging this! Sharon, thanks very much for the kind words, as it makes this even more meaningful and worthwhile. 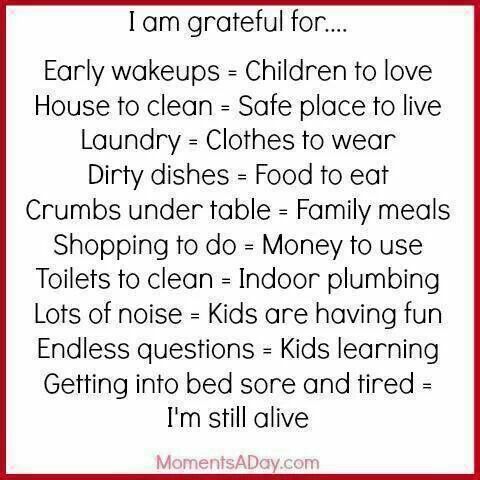 I hope you were able to find much to be grateful for during your reflection, as well!